Book one of the Waning Moon Duology introduces us to five sister-princesses who discover that their lavish life in the palace is not everything they think it is. 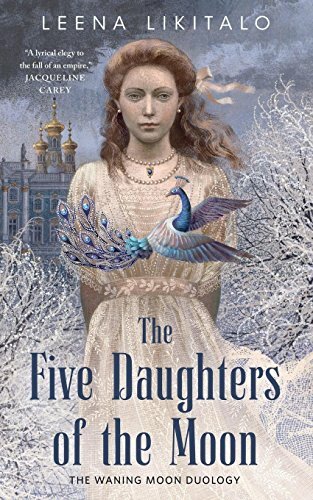 Alina, the youngest, sees shadows of things from another world and everyone thinks she's insane; Merile loves her dogs more than people; Sibilia dreams of being allowed to fall in love; Elise is already in love; and Celestia will be the next empress, but has been led astray. They live in luxury while their people freeze and starve in a mystical and fantastic version of Czarist Russia boiling with revolution and built on a technology that uses souls for power. It can't last. The Five Daughters of the Moon is the start of how it falls apart. Told from the points of views of all five sisters, it's a fractured story of a fracturing kingdom—none of the people involved tell anyone else everything they need to know and everyone holds secrets. Despite that, there's a lot of love, and when things get strange and then dangerous, the sisters pull together for safety and do what they can to save themselves and each other. Since this is only the first of two books, and so really half a story, it's unsure how their efforts will pay off, but they face the choices they need to make bravely and it's engaging and interesting to read. The language is interesting, too. Each daughter has her own distinct voice, and their ages—between six and twenty-two—means they have different understandings of what they see and what it means, and so we, as readers, get a multilayered view of the world and what matters in it. There are creepy priests, the gagargis, who take souls to power thinking machines. There's endless snow and cold. There are beautiful dresses and fancy balls. There are sweets and tea and birds everywhere. There's a religion built around the moon as their literal father and the empress as his agent on Earth, conceiving daughters to carry on the rule and to expand the empire. There's unrest caused by the danger and abuse the empire lays on its people, but also kicked up by nefarious forces and personal greed. We learn of all of it as the daughters do, and process it with them. What's most interesting is that despite being a story about the fall of a massive empire, it's told through the eyes of these five girls that make it personal; the warring is implied and its aftermath is shown, but it's not a war story. It's one part creepy palace intrigue, and one part multifaceted coming of age, one part magical realism and one part adapted historical drama. Punches aren't pulled, but they're buffered by the insulating world the girls lived in, so the horror around them can be seen and felt, but the mood doesn't get oppressively depressing or distract from the individual or shared stories the girls are telling. Also of note: Despite being a story of a desperate fleeing from a collapsing monarchy, the story takes its time. It's mostly quiet and calm; things simmer beneath the surface and sudden change is bookended by thoughtful contemplation and trying to figure things out. That's unexpected, and it works well with the characters we're given. A reader can't help feeling bad for these girls who spend the whole book learning that everything they know is wrong and that they're pawns in everyone else's plans, but since they don't fall into acting like victims, even when they're prisoners, they don't seem weak or irritating. They're strong and brave and doing the best they can with a bad situation and incomplete information. It's an odd one, but a beautiful one, too, and set in a world we don't see often in fantasy novels. The second half, The Sisters of the Crescent Empress, comes out in November this year to close the story.